Philippine President Duterte is destroying $5.4m worth of luxury cars seized from drug dealers. Watch LIVE! President Rodrigo Roa Duterte witnesses the condemnation and public destruction of contraband luxury vehicles and motorbikes at the Port Irene in Sta. Ana, Cagayan on July 30, 2018. 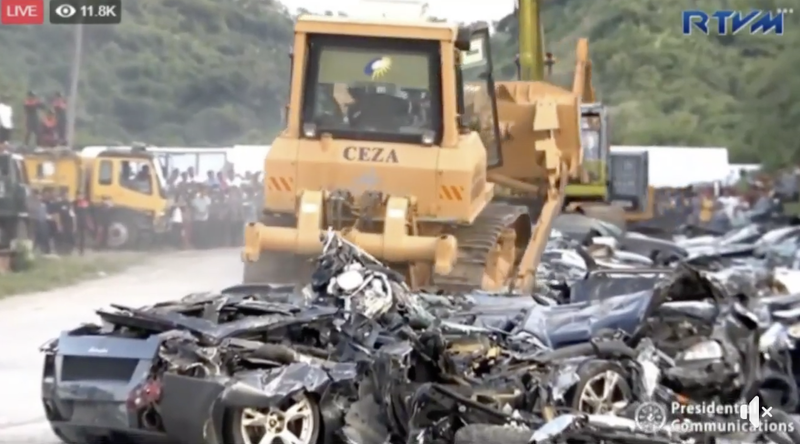 A total of 68 contraband luxury vehicles with an estimated value of more than PhP 277 million (as of 2014), and eight (8) contraband luxury motorbikes from Harley Davidson, Triumph, and Chopper manufacturers worth more than PhP 19 million (as of 2014), are set to be publicly wrecked through backhoe and bulldozer before the President and Secretary Raul Lambino who is the current Administrator and Chief Executive Officer (CEO) of the Cagayan Economic Zone Authority (CEZA). The condemnation activity is part of the administration's campaign against smuggling and corruption in the government.